Cream puffs are a deliciously simple yet decadent treat. Since they’re bite-sized, you can just pick one up and pop it in your mouth. The light pastry and the rich cream will just melt. This delectable dessert is also surprisingly doable at home! We’ve created a recipe for easy cream puffs for you to try yourself. Don’t worry — you don’t need to be an expert baker or pastry chef for these to come out amazing. Whether you’re baking a treat to serve at a dinner party or just want something sweet to have at home, these cream puffs are a great pick. Making this recipe is a great way to mix up your dessert repertoire. If you’re tired of making cakes and cookies, learning how to make cream puffs is a great way to branch out. 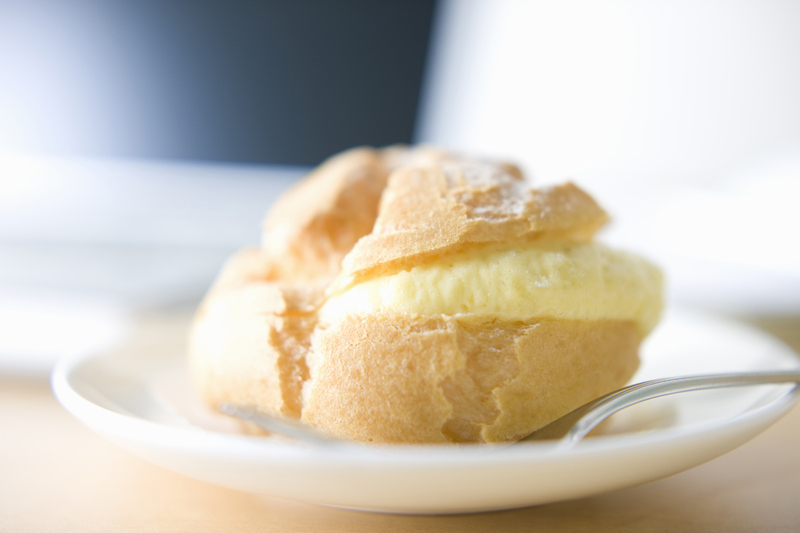 Check out our cream puffs recipe below to get started. In a small saucepan, combine the butter and the water and heat over medium-high. Let the butter completely melt and the mixture to come to a rolling boil. Reduce the heat to low and add the flour. Stir it vigorously until it forms a ball, about one minute. Remove the mixture from the heat and set it aside. Let it cool for about five minutes. Beat in the eggs one at a time with a hand mixer. Once you have added all of the eggs, beat the mixture until it is completely smooth. Drop spoonfuls of the mixture that is about the size of a ping pong ball onto the parchment paper-lined cookie sheets. Bake for about 20 to 25 minutes or until the puffs are completely dry. Let them cool completely. While the puffs are cooling, make the cream inside. Mix the instant vanilla pudding with the milk until the powder is fully dissolved. Add the sour cream to make the mixture thick. If it becomes too thick, add a bit more milk as needed. Chill the cream in the refrigerator for at least one hour. Once the cream has chilled, make sure the puffs are completely cooled. If they are warm at all, it will heat up the cream and make it too runny. Cut the thoroughly cooled puffs in half. Fill them with the chilled vanilla pudding mixture. Top the cream puffs with powdered sugar. If you have any leftovers, be sure to store them in a sealed container in the fridge. When you’re preparing these cream puffs, make sure to use Sauder’s eggs. Our dedication to providing eggs of the highest quality and freshness will leave you feeling confident you’re using only the best to cook for yourself and your family. Please use our store locator to find Sauder’s eggs at the nearest retailer.